Here you will be introduced to great talents that are lesser known or completely unknown to many. For one reason or another they seem to have fallen into the cracks of the Nashville sidewalks. It's darn hard to hear them from there, isn't it? 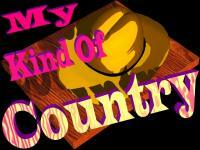 Well, it's not hard to hear them on My Kind Of Country. All you need is the Real Audio Player and you'll find out what you've been missing! If you know of any sites with links, waves, or info on anyone listed here please mail me so we can let the rest of the country fans hear what they're missin'. Let's face it... if you wanna be heard you gotta make some noise! It is my goal to help make this noise.... to let country music fans know about these wonderful artists and in my own small way, say "Thank you" to the singers who have given me and anyone who has heard them hours of pleasure and a lifetime of keepsakes in their music. Update: Most of these pages were created a very long time ago when MKOC was still in it's infancy. I have updated info from time to time, but not as much as it should be. I am currently in the process of updating all the pages with sound bytes and any new info... that is if I have new info to share. If you've been here before, you'll notice some big changes that have already been made. Martin Delray now resides on an entire page, not a little clip and there are song clips from both of his albums, "Get Rhythm" and "What Kind of Man". Where possible, I have added links where you can purchase these albums and those of other artists listed here... and believe me, a couple of years ago, that wasn't an easy task. I guess through enough searching, folks realized that the music created by these wonderful artists was indeed a commodity. Now, if only the recording companies that make the albums would wise up, they'd be rolling in dough 'cause there's a whole new generation of fans for these fine artists! UPDATE 2: Real Audio no longer works due to the changes in the program files that Real Media has created. There is no way I am able to reproduce ALL of the music on this site. I'm so sorry. You can generally find the music on the person's personal site or on Amazon.com Thank you for understanding. I'm just one person and only so much I can do on my own.